This article was published in the March 2003 issue of Antiquarian Book Review. 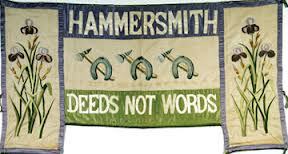 ‘Deeds Not Words’ was Mrs Pankhurst’s motto. The slogan flourished in the early 20th century – it was even embroidered on a banner – a reaction to the apparently unproductive campaign for the enfranchisement of women that had already been waged for nearly 40 years. The debate as to whether the vote was won by the slow drip of reasoned argument or by the sharp crack of breaking glass is one that still occupies historians. Althought it is the deeds of Mrs Pankhurst’s suffragettes – the spectacle of processions, the breaking of windows, the burning of houses and churches – that has coloured the popular perception of the suffrage campaign, without the ‘words’ that had over many years shaped the idea that women had an equal right with men to citizenship, the ‘deeds’ would have been committed in a vacuum. The women’s suffrage campaign was, during its entire 62 years, underpinned by ‘Literature’ in all its guises. Works written in support of women’s enfranchisement had little difficulty in achieving publication. The instigators of the movement were members of the articulate radical middle class and were in close contact with communicators. A tentative beginning had been made in 1851 with Harriet Taylor’s article The Enfranchisement of Women, which, shortly after her marriage to John Stuart Mill, was published anonymously in the Westminster Review ( a journal of which Mill had in the past been editor). This was followed in 1855 by a pamphlet, The Right of Women to the Elective Franchise, written by Agnes Pochin, wife of a future Liberal MP, and published by John Chapman, that ‘Publisher of Liberalisms’. 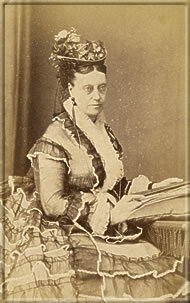 Among the names of the 1500 women who signed the suffrage petition that Mill presented to parliament in June 1866 (marking the formal beginning of the campaign), were several with connections to the publishing or bookselling trades – including Elspet Strahan, sister of Alexander Strahan, a liberal with a zeal for social reform and the publisher of the eponymous publishing house. He had recently launched the Contemporary Review, in which he published an article on ‘female suffrage’ in March 1867, written by Lydia Becker. Once the campaign had been launched, ‘words’ in support of women’s enfranchisement multiplied rapidly. The societies that had formed to promote the cause published a plethora of pamphlets – one of the first, of which 4500 copies were distributed, was a reprinting of the speech made by Mill to Parliament during the debate on the second reform bill in May 1867. The accounts of the earliest Enfranchisement of Women Committee show that in its first year of existence over £94 was spent on printing. This was set against receipts from the sale of pamphlets of only £6 11s. Political publishing was not a profitable business. In reality, political publishers who were prepared to put their imprint on books and journals to promote the woman’s cause were not so unworldly as to risk their money. A study of the ledgers of companies, such as Trubner and H.S. King, reveals that many of the suffrage publications, including Lydia Becker’s The Women’s Suffrage Journal, were published only on a commission basis. Under this arrangement, the author or the society undertook all the risk of publication, while the publishers merely provided the service of printing, binding and distribution, for which they gave the book their imprint, charged a fee and took a percentage of sales. Publishers’ ledgers, where they have survived, provide an interesting keyhole through which to view the suffrage campaign. Lists of payments make it possible to identify an author who published anonymously, the print order for a book, journal or pamphlet can give us an idea of the ambition of the author or society; and the number of pulped gives a reason why so many of the items are now extremely scarce – and expensive. The suffrage campaign appeared to have made such considerable progress in its first years that Mill, a canny businessman as well as philosopher, felt the time was ripe to publish the work that he had first drafted in the early 1860s on ‘the woman question’. 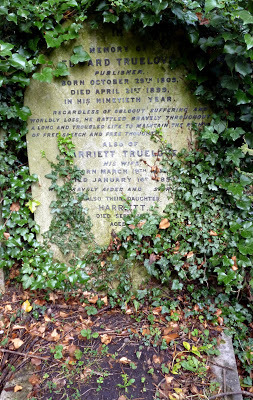 As he wrote in a letter to The Times on 9 April 1869: ‘It is not specially on the Suffrage question, but on all the questions relating to women’s domestic subordination and social disabilities, all of which it discusses more fully than has been done hitherto. I think it will be useful, and all the more, it is sure to be bitterly attacked’. 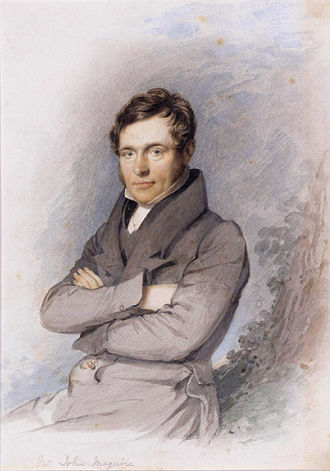 Mill knew full well the publicity value of controversy. The Subjection of Women was published by Longmans in May 1869, went into a second edition in the same year, and has remained ever since a central text of the women’s movement. It took until 1902 for the first history of the campaign to appear. 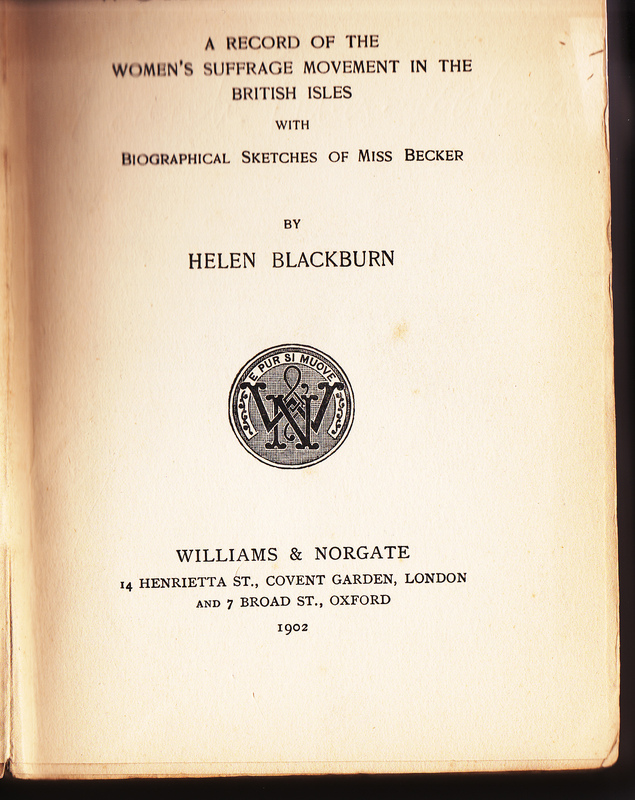 Women’s Suffrage: a record of the women’s suffrage movement in the British Isles with biographical sketches of Miss Becker was painstakingly compiled by Helen Blackburn, who had for many years worked as secretary of the Central Committee for Women’s Suffrage. The new force that emerged in 1903, Mrs Emmeline Pankhurst’s Women’s Social and Political Union, did not delay so long before giving itself a distinctive history. 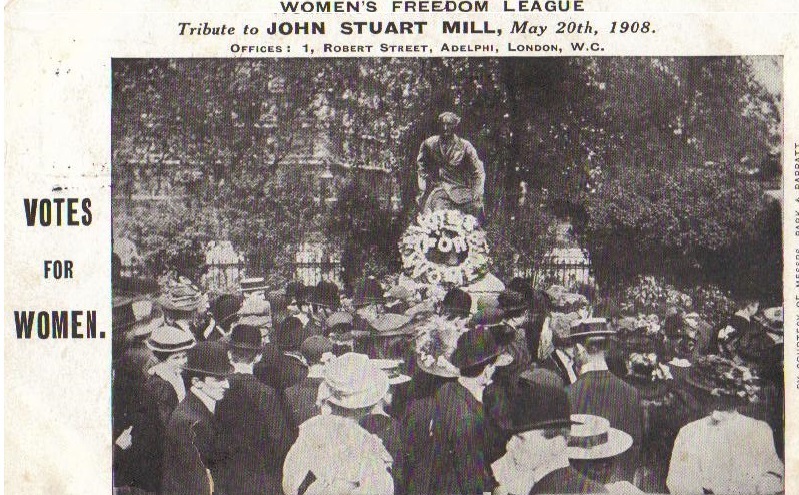 A series of articles written by Sylvia Pankhurst, daughter of Emmeline, as The History of the Suffrage Movement, appeared in the WSPU’s new paper, Votes for Women, starting in the first issue in October 1907 and concluding in September 1909. This history was, naturally, shaped to emphasise the Pankhursts’ centrality to the movement. 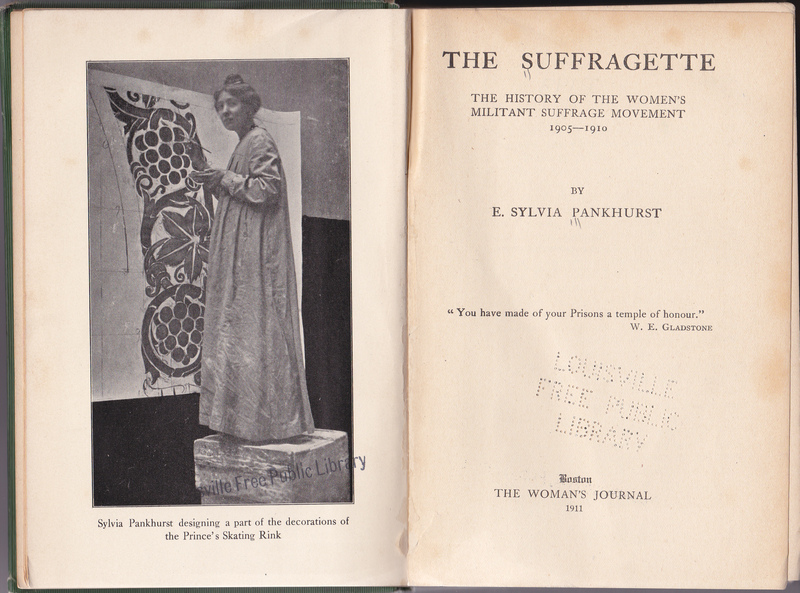 Bibliophiles might like to note that the book that emerged from the articles, The Suffragette: the history of the women’s militant movement, was first published in America in 1911 by Sturgis & Walton and sheets where only then shipped back to Britain, where it was subsequently published by Gay & Hancock. The publication in 1912 of Women’s Suffrage: a short history of a great movement (TC & EC Jack), written by Millicent Fawcett, did something to redress the balance. She had been involved with the campaign since its earliest days and since 1907 had been leader of those who described themselves as ‘law-abiding’ in contradistinction to the militants. 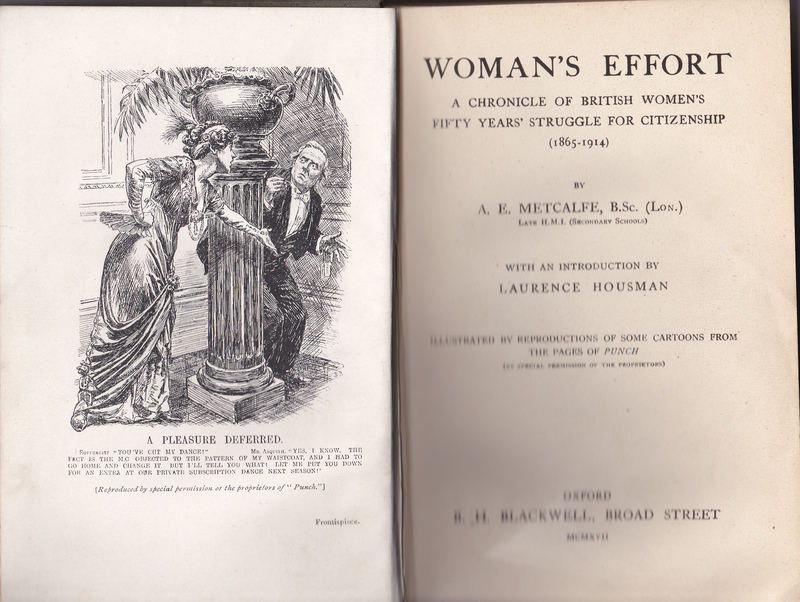 Agnes Metcalfe’s Woman’s Effort: a chronicle of British Women’s Fifty Years Struggle for Citizenship (1865-1914), published in 1917, gives a detailed overview of the campaign, concentrating on the efforts of the militants. 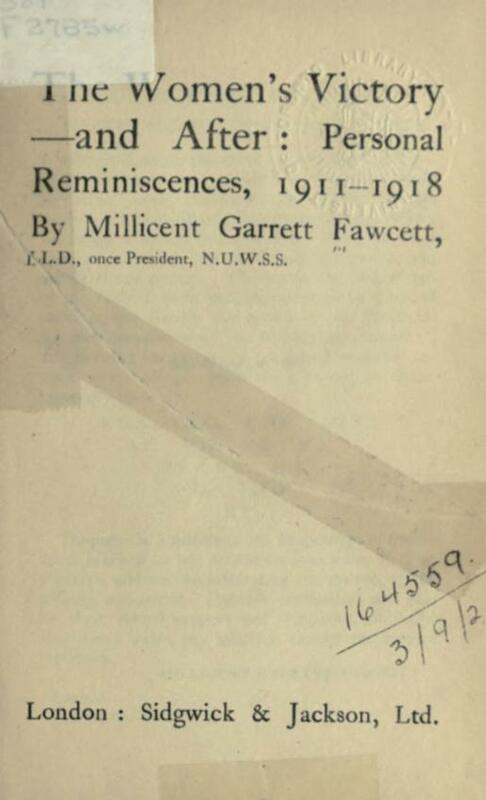 In 1920 Mrs Fawcett completed her history of the suffrage campaign, begun in A Short History, with another pithy summary of events that had led to the passing of the Representation of the People Act, 1918, granting the vote to women over the age of 30. All these books were bought (as ownership inscriptions found in them testify) by sympathisers to the cause, were part of the stock of the small lending libraries run by many of the local suffrage societies and also found their way into the public library systems and even into prison libraries. While imprisoned, suffragettes were able to read lives, such as those of Joan of Arc and Garibaldi, that they considered (by analogy) relevant to their cause – the cult of the ‘hero’ clearly appealed to those conscious of their role in history. Alongside the polemics, the women’s suffrage campaign also provided a rich seam mined by writers of fiction. John Francis Maguire, MP for Cork and an active supporter of the woman’s cause, was the first, publishing in 1871, a year before his death, a three-decker, The Next Generation (Hurst & Blackett). The action was set in 1891, by which time the ‘Rights of Woman’ movement..was a wonderful success [and had] long since been accepted with satisfaction almost universal’. Eighty-nine women MPs sat in parliament and Mrs Bates was chancellor of the exchequer. Throughout the 19th century, a stream of novels used support for, or antipathy to, the suffrage cause as a shorthand by which to delineate characters or to put plot machinery into gear. An indication that the campaign was losing its momentum at the end of the century may be surmised from the fact that between 1900 and 1906 no ‘suffrage’ novels were published. 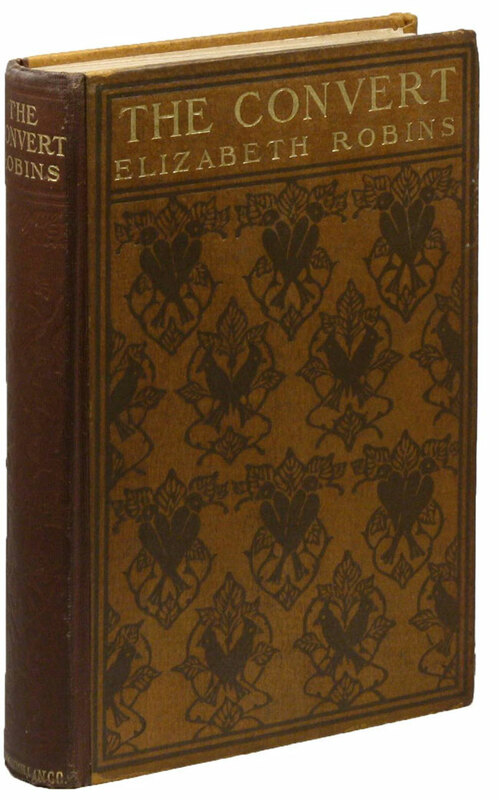 The Convert was in fact Elizabeth Robins’ novelisation of her play Votes for Women!, written during the autumn of 1906 and first staged at the Royal Court Theatre in April 1907. For Kate Parry Frye’s description of a visit to see the play on 16 April 1907 click here. All in all, the wide range of ‘suffrage’ literature published during the course of the campaign – histories, tracts, speeches, leaflets and novels – offers historians and collectors a fascinating lens through which to view not only the political battle in all its complication, but also the changing perception of the position of women that in the end was so necessary to the winning the vote. 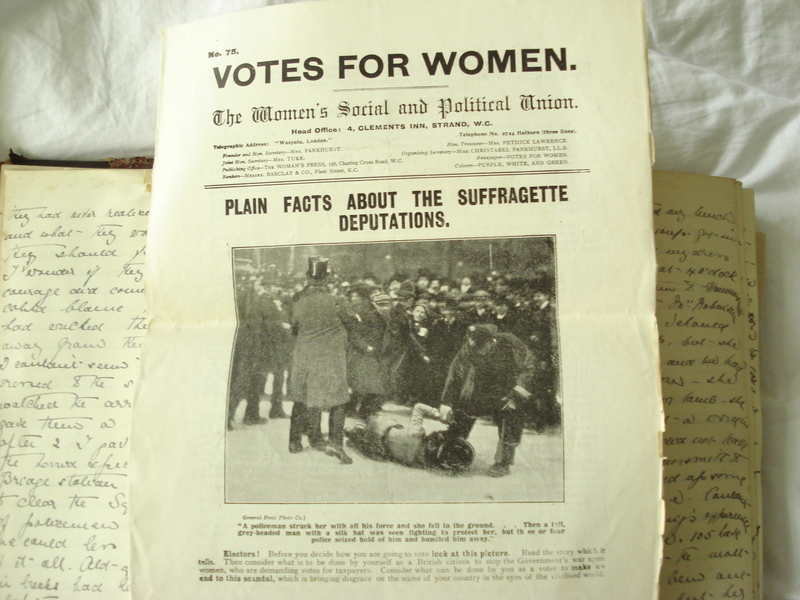 This entry was posted on May 7, 2014, 12:00 pm and is filed under Collecting Suffrage, Suffrage Stories. You can follow any responses to this entry through RSS 2.0. You can leave a response, or trackback from your own site.